See how these fundraising ideas by Lilian Sue can help you diversify your tactics. When you’re thinking about starting your first fundraising campaign, it can be overwhelming on where to begin. Before you start, you need to decide on your fundraising goals (ie. how much money you want to raise) and what the funds will be used for. Are you raising money for new equipment, your next event or to afford a new facility? Once you determine what your goals are, you can set up the parameters, such as what platforms you’ll use and how long the campaign will run for. I’m a big believer in diversifying your campaigns as well, instead of relying on just one platform. If you’re running a fundraising campaign to send children on your program to camp, don’t just rely on soliciting donations through your website or crowdfunding. Diversifying ways that donors can donate to one campaign not only makes it easier for them, but it also gives you more revenue streams-taking the pressure off if one area of fundraising isn’t doing as well as others. Below, I’ll be outlining some of the most popular cost-effective methods for online fundraising along with platforms that you can use. In the next fundraising installment, I’ll be focusing on creative ideas. Crowdfunding is by far the most popular online fundraising method and there’s no shortage of options. You want to maximize the donations you receive for a campaign, so it would be better to use platforms that allow you to keep as much of the donations as possible. 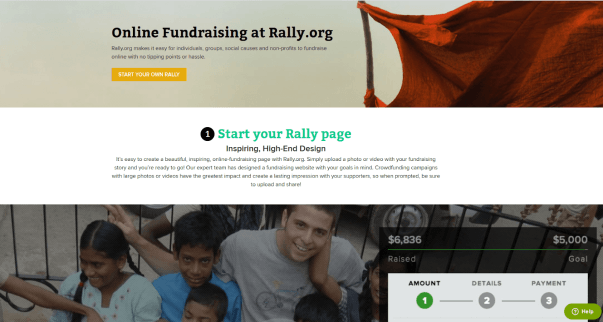 Try Rally.org, which caters to social causes and non-profits. It has ready-built templates available to easily build a campaign page, complete with photos and videos. From there, you’ll be able to use their integrated social sharing buttons to share the campaign through email, Facebook, Twitter & other sites with a few clicks. When you start collecting donations, Rally.org charges 5.00% + credit card fees (2.9% + 30 cents) for each donation processed but everything else is free. You’ll also be able to track donations through their online dashboard with built-in analytics. 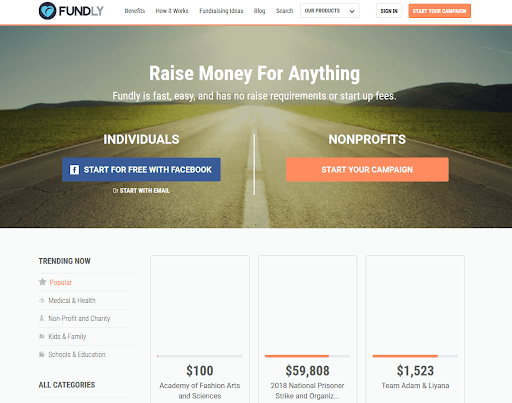 Chuffed, an online fundraising platform that supports social community causes as well as non-profits, allows users to create and manage fundraising campaigns completely for free. Non-profits also keep 100% of the donations they receive. They walk you through on how to set up your campaign page, including campaign pitches and descriptions. The platform also has ideas on how to promote your campaign as well. Fundly focuses on mobile fundraising through their free Fundly app and offers guides on every step of fundraising. They walk you through how to upload great videos, photos and story updates to keep donors informed and their integration with Facebook OpenGraph integration broadcasts any campaign activity to keep your donors informed. The platform does charge a 4.9% platform fee, along with a 2.9% credit card processing fee plus $0.30 per transaction. You might already participate in #GivingTuesday, a nationally recognized day of charitable giving across North America but that doesn’t mean you can’t create your own giving day. It’s one of the easiest ways to create a fundraising campaign because you don’t even have to leave your website. Online giving days have the potential to work really well as they create a sense of urgency among your supporters and fans. Through your promotional efforts, they’ll band together to raise as much money as possible during the 24 hour period. If you have some leeway for the giving day campaign, also consider signing up on Thunderclap. You’ll craft a message, choose a goal for the number of supporters, pick the date/time for people to share your message and recruit supporters. When you reach the supporter goal, the message will be automatically published on your supporters’ social media accounts at the same time, amplifying the message. You can either sign up for the free plan (where the campaign takes 3 days to approve) or the Lightning plan which is $55/campaign with 24-hour approval. This is another option when you’re looking to host shorter fundraising campaigns. You can launch a day-long or a week-long matching donation campaign on social media such as Facebook, Twitter, Instagram, YouTube and LinkedIn. 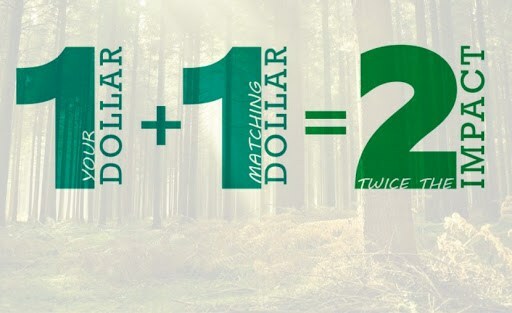 You’ll need to partner with a local business (or perhaps a few local businesses) who agree to match all donations for the length of the campaign. This type of campaign has flexibility as prospective donors don’t have to work for the partner businesses to have their gifts matched. Share the campaign a few days or a week before the big launch, making sure to promote the partner businesses as well (and agree that the partners will promote it on their channels) and make sure to get reminders out there on social as well. In the next installment, I’ll be focusing on creative & fun ideas for fundraisers before moving on to events. Subscribe below for more great fundraising ideas, social media and content marketing strategies. Share your thoughts about fundraising for your nonprofit in the comment section below. I’m really looking forward to reading your comments.